International Monetary Fund (IMF) has appointed Mysore-born Gita Gopinath as its chief economist. Gopinath is now the first woman to occupy the top executive IMF post. 47 year old Gopinath is the John Zwaanstra professor of International Studies and Economics at Harvard University, Gopinath. At IMF, she succeeds Maurice (Maury) Obstfeld as economic counsellor and director of the research department, IMF. Obstfeld retired December 31, 2018. “One of the world’s outstanding economists with impeccable academic credentials, a proven track record of intellectual leadership and extensive international experience,” said Christine Lagarde, Managing Director, IMF, while announcing Gopinath’s appointment. 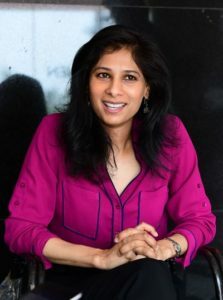 In her recent interview to The Harvard Gazette, Gopinath, 11th Chief Economist of IMF termed her appointment at IMF as a “tremendous honour” and her appointment as the first ever woman as chief economist speaks highly of IMF’s Managing Director Lagarde.